As a child, Miami-born Michael Beltran was fascinated by the sense of pride he observed in his Cuban grandparents when they cooked for 20 or 30 people. He carried that feeling until college when he did a little bit of everything at an Applebee’s in order to learn as much as possible about running a restaurant. It was that same pride—in his family, in his culinary journey, in his cooking—that led him to open Ariete in Coconut Grove in 2016. Named after his grandparents’ restaurant in Cuba, it was named Best Restaurant in Coconut Grove by Miami New Times and was Eater Miami’s people’s choice for Restaurant of the Year. But the shine of a new restaurant wore off. A little more than a year after a successful opening, Ariete went through a slump. The trio decided they weren’t going down without a fight. They were going to “really be who we are” or fail trying. They started doing charcuteries, sourced the best products, created new menu items, opened another day of brunch, opened Mondays to be more available for the neighborhood. The community responded. This month, Ariete is celebrating its three-year anniversary. While the restaurant is Cuban-American driven, its ever-evolving menu includes creative dishes that possess a distinct Miami feel thanks to locally sourced ingredients. The foie gras, which is “as Miami as it gets,” features plantains, sour orange, caramel and cocoa nibs. A beet dish features guava and tahini mousse with beet powder and pistachio. A recent trip to a Homestead farm yielded about five new dishes. 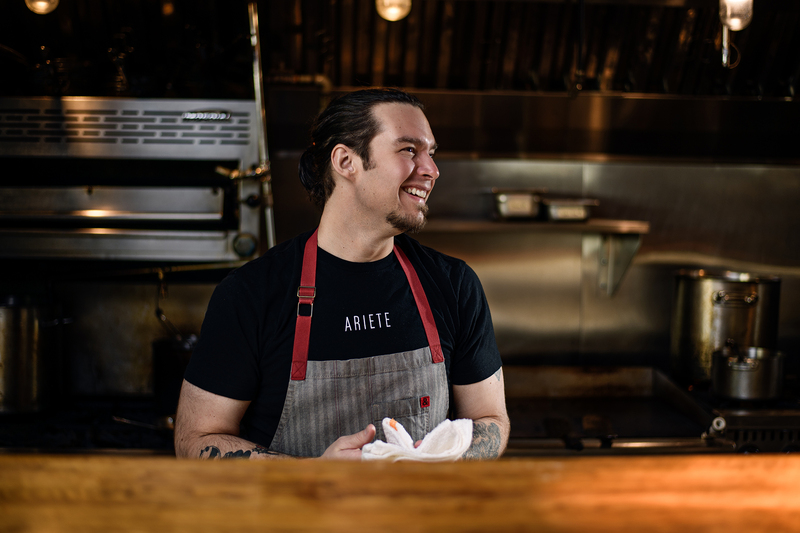 Beltran’s confidence in what Ariete stands for is rooted in his childhood as well as his experiences with some of Miami’s most renowned chefs—including Norman Van Aken. 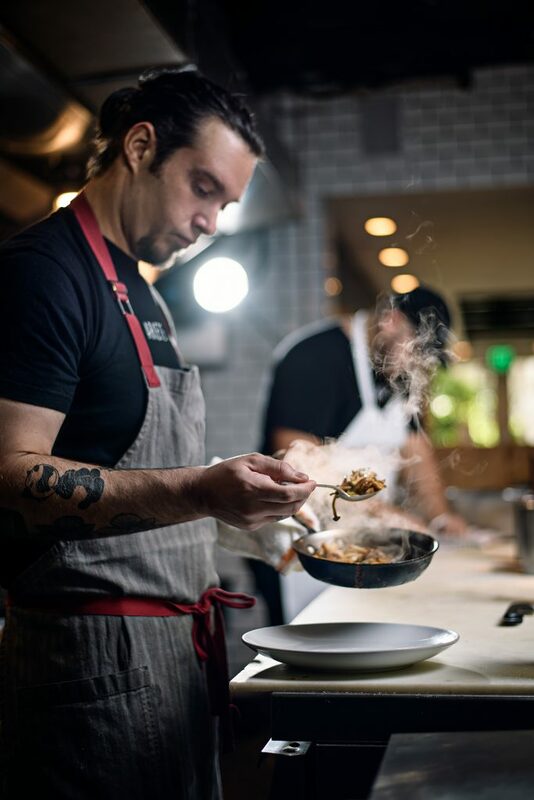 Beltran worked with the founding father of New World Cuisine for three years, working as a prep and line cook at Norman’s 180 when it opened in 2010 and then serving as Van Aken’s sous chef at Tuyo; along the way, he met Hockin and Fesser. As if working with one Miami legend weren’t enough, Beltran also learned from James Beard Award winner Michael Schwartz at Cypress Room, where he grew to understand “the nooks and crannies” of running a restaurant. While he is determined that Ariete continue to change with Miami, Beltran observes that life is cyclical. Not only does he meet with his grandmother regularly to go over recipes, but he also still applies what he learned at Applebee’s—that running a restaurant goes beyond cooking, beyond being a chef even. Next month, Ariete’s Gio Fesser makes an appearance at Bacardi’s Beach Carnival, the closing event of the annual South Beach Wine and Food Festival. Hosted by Andrew Zimmern, the event features games, live music and, of course, bites from local chefs such as Fesser, whose nickname, Pastelito Papi, speaks to the popularity of the Cuban pastries he makes at Ariete. When: Feb. 24, 6-9 p.m.